Looking through my bookshelves for inspiration for today’s post, I found - as you do - Caxton’s translation of ‘The Book of the Knight of the Tower’. I pulled it out, opened it up, and immediately came across a wonderfully ridiculous anecdote, a cautionary tale about what happens when women eat delicacies without their husbands' knowledge. Yes. 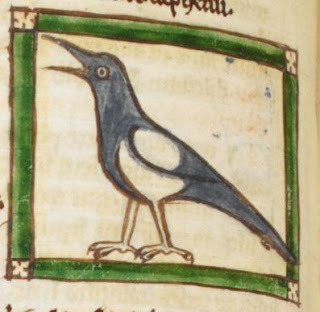 A young married woman had a pet magpie or ‘Pye’ which could speak, and would talk about everything it saw. In one of his ponds, her husband happened to keep a large eel, which he was saving to have cooked, as an impressive dish, to any important guest who might visit him. Then one day when her husband was away, the lady decided she fancied eating the eel herself. And when the lord heard this, he went to his pond and found not his Eele, and came home to his wife and demanded her what was befallen of his Eele? And she attempted to have excused her. And he said to her that he was ascertained thereof, and that the Pye had told him. And in the house therefore was great sorrow and noise. …from then forth on, if any man came into that house that was bald, or pilled [shaven] or had a high forehead, the Pye would say to them, ‘ye have told my lord of the Eele’. And therefore this is a good example, that no good woman should not eat for her licorousness [greed] the sweet or dainty morsels without the witting [knowledge] of her husband. This damsel was after much scorned and mocked for that Eele, by cause of the Pye that so oft remembered it to such as came thither bald or shaven. Fabulous, yes? That’ll teach her to eat eels behind her husband’s back. The comedy is so slapstick (‘he went to his pond and found not his Eele’) it’s clear this story was always a funny one, the difference between now and then, however, being that now we enjoy the comedy and ignore the moral, while then the moral was the important part, and the comedy was there only to enliven it and make it memorable. The Knight of the Tower really did believe that wives had better not sneak delicacies their husbands never intended them to have. And of all good she seemed to me the best and the flower, in whom I so much me delighted: for in that time I made songs, lays, roundels, ballads, virelays and new songs in the most best wise that I could; but death which spareth none hath taken her, for whom I have received many sorrows and heaviness in such wise that I passed my life more than twenty years heavy and sorrowful. Seeing his daughters coming towards him, ‘young and little’, he begins to remember the days when he himself was a young man ‘and rode with my fellowship in Poitou’; how his friends (and he?) 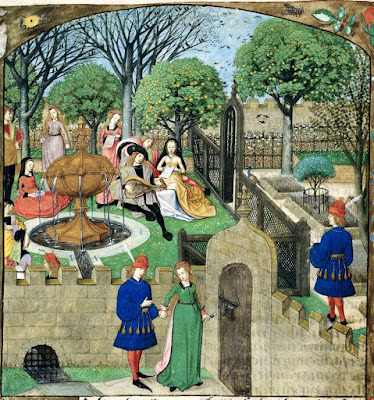 ‘had neither dread nor shame… and were well-bespoken … and thus they do nothing but deceive good ladies and damsels’. You can’t help but like him, and I like him even more when he adds: “I have made two books, one for my sons and the other for my daughters.” The one he wrote for his sons has not survived; down the ages people have commonly been less concerned about the morals and behaviour of their boys. 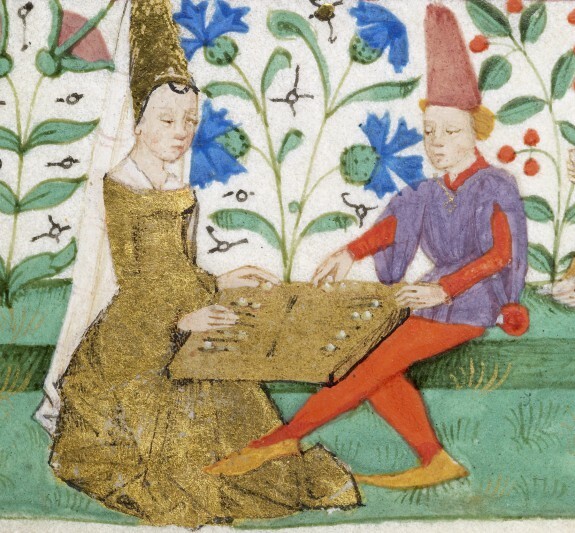 The book of advice for girls, however, became an instant smash hit, copied many times. “There are still at least twenty-one manuscripts of the French text in existence,” says the intro to the EETS edition, “and an English translation was made during Henry VI’s reign; Caxton made a new English translation which he printed in 1484, and a German version made by Marquart vom Steim, ostensibly for his own two daughters, was published at Basle in 1493.” It continued in print right into the 19th century. It’s easy to see why it would have been popular, even for the young women who were supposed to be benefiting from it. It’s so lively! The text is studded with Awful Examples which are enormous fun to read. 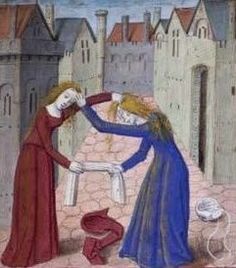 The chapter on ‘How women ought not to be jealous’ opens with a fight between two ladies, one of whom breaks the other’s nose with a staff. Chapter 15 (xviij) is titled ‘How a woman sprang upon the table’. In Chapter 19 (xix), ‘Of the woman that gave the flesh to her hounds’, a lady insists on feeding her two little dogs on ‘daily dysshes of soupes and fryandyses delycyous’ (delycyous is so much more delicious than delicious, don’t you think?) in spite of the warnings of a friar who tells her not to waste food which could be given to the poor. Naturally she then falls ‘sick unto the death’ and ‘there came upon her bed two little black dogs’ which lick her lips and mouth till they turn it ‘as black as a Cole’. Shiver! Yes, there are nine chapters listing the nine follies of Eve (some of which I lifted for the use of nasty Brother Thomas in my medieval fantasy ‘Dark Angels’). Yes, there are plenty of pious examples taken from the Bible. But these are constantly enlivened by tabloid stuff such as Chapter 62 (lxij) ‘Of the roper or maker of cordes and kables and of the fat Pryour that was Ryche and a great lechour’. Who wouldn’t want to read that? 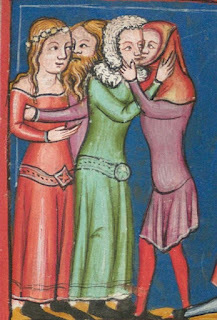 In a last example, the Knight warns his daughters not to argue with fools or hot-tempered people. For it is great peril. Wherof I shall show to you an example which I saw happen in a Castle wherein many ladies and damsels dwelt. And there was a damsel, daughter of a right good knight. And she wax angry [lost her temper] in playing at tables [gambling] with a gentleman which was hot and hasty and most Riotous, and was not right wise. And the debate was of a dice, which she said was not truly made. And so much it increased that words were enhanced, and that she said he was a coward and a fool. And so they left their play by chiding and strife. The Knight was a witness to this event, for he tries to offer advice, which of course isn’t taken. Then said I to the damsel, My fair Cousin, anger yourself with nothing that he says, for you know well he is of high words and foolish answers … but she would not, and she said to him that he was worth nothing… and so the words arose, that he said, if she had been wise and good, she should not come by night into the men’s chamber and kiss them and embrace them without candles. And she said that he lied, and he said he did not … and there was much people that heard it and knew not what to think. People haven’t changed much down the years. 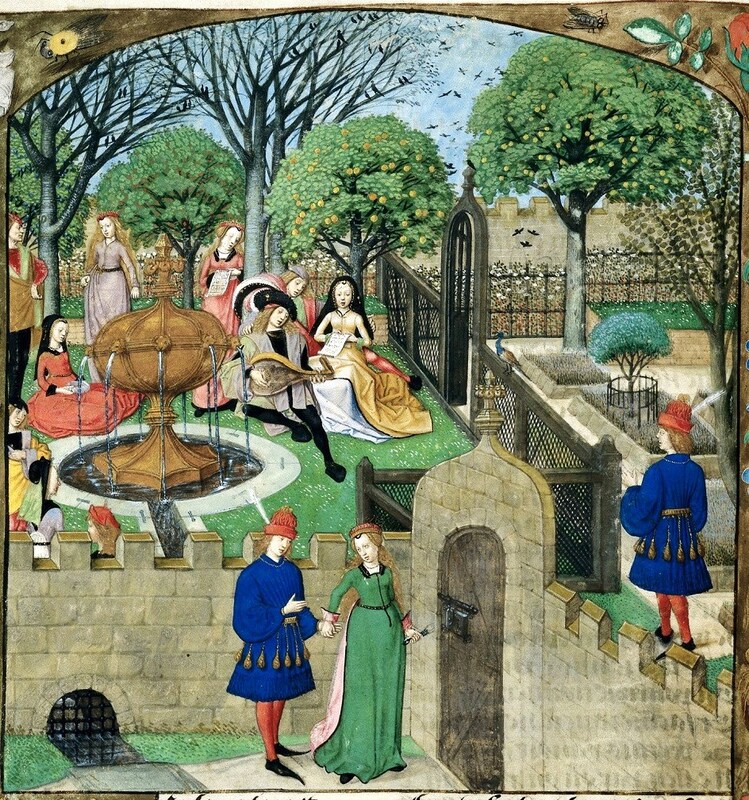 Courtly love might have been the ideal, but here is a vivid glimpse into the lives of the privileged, bored, hasty-tempered and – we should remember – often very young noblemen and women of the fourteenth century castle. Goodness, how did I miss this one? I love the sort of book that takes you right back to the time it was written. When, for example, Suetonius says in The 12 Caesars, “My father was with Emperor Otho and he said...” and ”When I was a child, I saw...” I feel transported to that time and place. And it sounds like this book was a bestseller in its time! I hadn’t thought of Caxton as a translator, only a printer. You learn something every day! What a wonderful find, Katherine! Pity the book for boys didn't survive, though - it would have been interesting to know how far the advice differed!